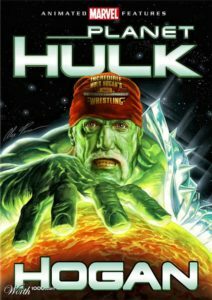 Unlikely Comic Crossovers: The Hulk vs. Hulk Hogan — Miserable Retail Slave. This is a feature that will take a look at the odd, wacky, and stupid crossovers that have randomly occurred for one reason throughout comic book history. Up until 2005, both Hulks were a trademark of Marvel Comics. According to his autobiography, Terry Bollea acquired his famous wrestling name after appearing on a local talk show in Memphis with Lou Ferrigno. Jerry Jarrett, Memphis territory promoter and father of Jeff, noticed that Bollea was actually much larger than TV’s Incredible Hulk and decided to start promoting him as Terry “The Hulk” Boulder. It was better than Thunderlips. 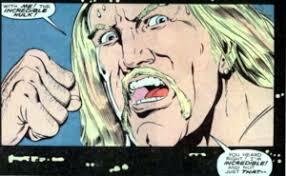 It’s a shame that Marvel didn’t properly utilize the Hulk Hogan trademark. We could’ve had Hulk Hogan putting The Beyonder in a headlock in Secret Wars. We could’ve had Hulk Hogan drop the leg onto Thanos in The Infinity Gauntlet. We could’ve had the ultimate ‘80s match-up with GI Joe vs Transformers vs Hulk Hogan. 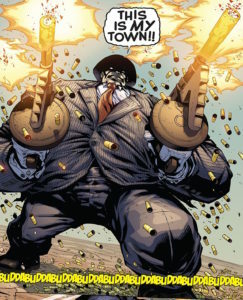 The Hulk in a suit and using machine guns. Why would he need to use machine guns? Shhh. Just look at how cool the image is! 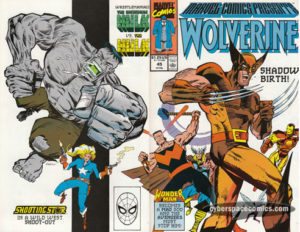 Ultimately, a likeness of the Hulkster was used in Marvel Comics Presents in a story by Peter David, whose 12 year run on The Incredible Hulk yielded some of the best Hulk stories to ever be told. The success of Spider-Man’s black costume and the popularity of “grim and gritty” heroes with attitudes led to numerous changes throughout Marvel’s characters. How do you give the Hulk more grit? You make him a clever and manipulative Las Vegas enforcer named “Mr. Fixit” with questionable morals and a snarky attitude. Plus, you take away the green skin, replace it with the original grey and now you have one of the most interesting and original takes on the Hulk ever written. Seriously, if there is ever another Hulk television series, this should be the premise. Grey cranky Hulk in Vegas. Make it happen, Marvel. At the time of the story’s publication, Mr Fixit had been trying to bury his former life as the Hulk and was doing a decent job at it. Despite the fact that he was a super strong, bulletproof brute with a weird skin condition, nobody seemed to be connecting the dots. The fact that a professional wrestler is using “The Incredible Hulk” name to find success is too much for Joe Fixit’s pride to handle, even though it might put his current secret identity at risk. A challenge is laid down and the result is basically a squash match, the likes of which the real Hulk Hogan had been on the winning side of countless times. I distinctly remember grabbing this issue off the spinner rack at my local drugstore and being amazed by the fact that the Hulk was facing off against Not-Quite-Hulk Hogan. Amazed and a little bit embarrassed by the stupidity of it. Even then, I loved stupid things, so I’m not exactly sure why I didn’t buy that issue. My guess is that I didn’t embezzle enough school lunch money that week, which was my preferred method of buying comics in my pre-teen years. Money problems. Some things never change. Honestly, I’m impressed by the restraint shown by WWF in never attempting a real life Hulk vs. Hulk matchup. That’s stupid, you might say. They’d never do something like that. Fine, I reply. I won’t bring up the Wolverine vs. Magneto promotional stunt from a few years ago. Dig the content in this post? Check out the latest episode of The Miserable Retail Slave podcast! Newer PostMiserable Retail Slave episode 200. "The Unwritable Miserable Retail Slave"